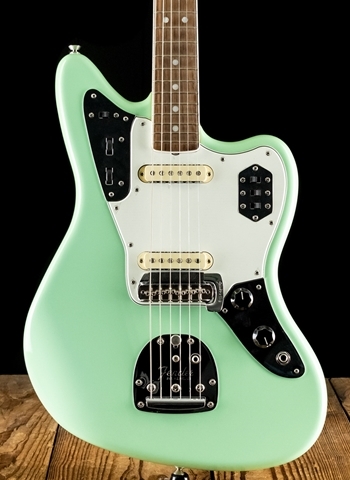 Never resting in our mission to make life better for musicians, we created the short-scale Jaguar guitar in 1962. Originally released as our featurerich, top-of-the-line electric guitar, it inspired the heroes of the musical underground and hit its stride with surf, punk and alternative guitarists. The American Original '60s Jaguar brings that supple sound and slinky playability to life again, slightly tweaked for a modern feel. The wax-potted Pure Vintage '65 Jaguar singlecoil pickups are as period-correct as possible, from the enamel-coated coil wire to the clothcovered output wires, fiber bobbins and alnico 5 magnets. We kept the Jaguar’s unique circuitry intact for this incarnation; the familiar lead/ rhythm circuits are there, along with the bass-cut "strangle" switch. Other authentic touches include vintage-tall frets, original-era body radii, vintagestyle hardware - including floating tremolo with lock button and push-in arm - vintage-style hardshell case and a lacquer finish that not only lets the wood "breathe" naturally with resonant tone, it also wears in a distinctively appealing way. An inspiring instrument, the American Original '60s Jaguar is a great way to experience the performance, style and tone that made Fender the choice of axemen with attitude.